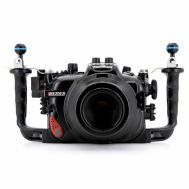 The Nauticam Panasonic G9 underwater housing is an ergonomic and fully featured housing with unmatched ease of use from the leader in underwater photography. Key camera controls are placed within an easy reach from the ergonomic, rubberized handles. Controls on the housing are placed exactly where they should be for easiest access in water, regardless of the camera layout. A large, sculpted shutter release lever is placed at the right hand grip for index finger operation, and features a patented geared mechanism that improves sensitivity for tactile feel of half press and full press. To facilitate back-button autofocus, the AF/AE lock button (which can be reassigned to activate AF) is controlled by a thumb lever near the right handle. No other housing comes close to achieving this kind of ergonomic access to these critical controls. The housing Locking Latch System has received acclaim worldwide for its ease and functionality. These recessed latches are equipped with safety locks, reduce bulk and require minimal physical effort to engage and release. Port changes have never been simpler than utilizing the Patented Nauticam Locking Port Release Lever. No wrestling, no twisting, no misalignment – just seat and lock. Lens changes are also easily accomplished without removing the camera from the housing using the lens release button logically accessed on the housing front. Following hot on the heels of the ground-breaking GH5, Panasonic's G9 shares many features with its sibling but is squarely aimed at the still photo shooter. The G9 features a 20.3 MP Live MOS sensor and Panasonic's Dual I.S. 5-axis 2.0 stabilization that allows for up to 6 stops of stabilization. This is combined with ultra-fast (0.04 sec) lock focus, 12fps continuous shooting with AFS and the mechanical shutter or a blazing 60fps AFS and 20fps AFC high-speed burst shooting with the electronic shutter with no blackout, a game changing feature also recently touted by the Sony A9. Nauticam produces a “straight” 180º enlarging viewfinder and a 45º angled enlarging viewfinder to enhance the ease of close quarters work often associated with macro shooting. Both viewfinders have high quality optics, and allow bright viewing of the entire image. A patented external dioptric adjustment allows personal adjustment to a sharp-as-a-tack standard underwater and viewfinder changes can be executed in less than 30 seconds without using tools. 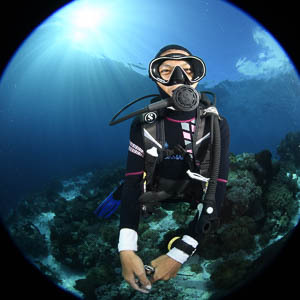 Experienced shooters know a camera is only as good as the lens in front of it, and the same is true when choosing optics for an underwater camera system. A variety of wide-angle and flat ports are available in the N85 system to accommodate a large portion of the Micro Four Thirds open-standard lenses. The Nauticam vacuum check and leak detection system electronics are included with the NA-G9 as standard equipment. Combined with an accessory vacuum M14 valve (PN 25624), this monitoring system provides constant updates on the water tight and safe-to-dive status of the housing. A simple color coded LED lighting system lets the user know that the vacuum is solid, or that the housing is losing vacuum. Leak detection is built into the same circuit, so if there is water intrusion, an audible and visual indication will occur. No system is easier to assemble or break down. The camera drops into the housing with a quick release camera tray. No controls need to be preset, as housing functions for dials and switches align automatically (on/off, still photo/video). Nauticam build quality is simply unmatched, using cutting edge product design and modern, innovative manufacturing techniques that result in service-free reliability. Focus and Zoom gears for many MFT lenses.